This post is a continuation from Biomedical Image Processing – IV. In an 8-bit gray scale image, any values of Pout below 0 or above 255 are set to 0 and 255, respectively. Figure 17. Example of contrast stretching [http://www.dai.ed.ac.uk/HIPR2/stretch.htm]. Logarithmic/exponential (a.k.a. 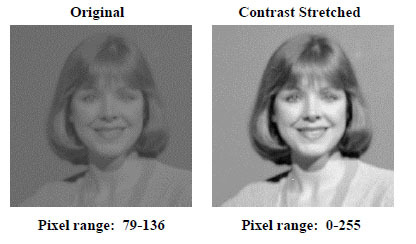 “raise to power”) operators are used to enhance low/high pixel values, respectively, where a relative loss of information occurs in the high/low pixel values.